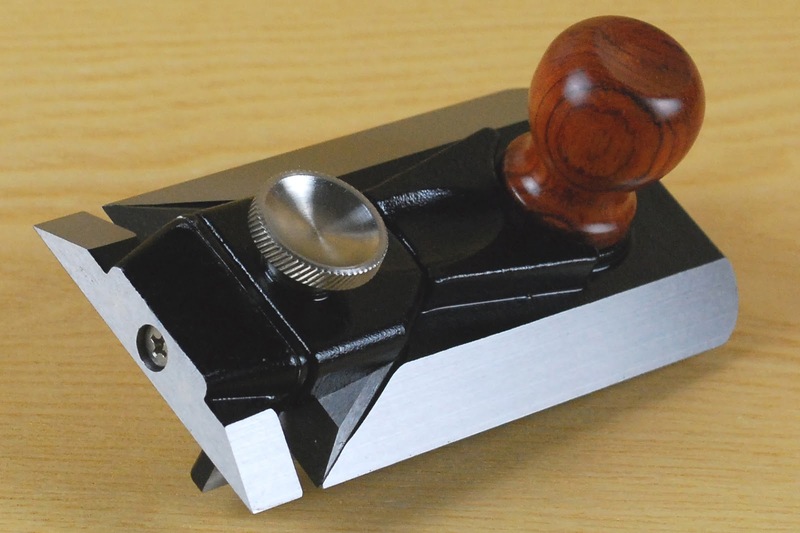 Metal shoulder rebate planes have been with us, in one guise or another, since the 1860's when Edward Preston and Sons started it all off with the No.1369. Given that they have been around for so long I doubt if I am the first to figure this out, but when you come to the job of honing the blades it certainly makes life a whole lot easier, so I thought it was worth sharing. A shoulder rebate plane is used for perfecting the final fit of existing rebates (rabbets / rabbits / whatever..) or indeed any other situation where you need to fine tune a surface with reference to an adjacent shoulder. They take the merest whisp of a shaving and their performance on endgrain is enhanced by the very low bedding angle and skewed blades. The blades are ground at 15 degrees which is great for softwoods but a little bit low for hardwoods. This brings us to the problem of how on earth you hold these tiny skewed cutters to put a secondary bevel on them? The answer: Take off the fence and removable nose of the plane, swap the cutters over and invert them, and the plane becomes it's own honing guide. The angle can be adjusted by altering how far the blades protrude. 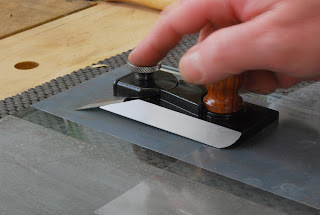 Note the use of a slip of backing film to prevent the sole of the plane from being eroded. For increased edge strength you can also add a micro back bevel on the underside of the blades using the same technique, but with the blades the right way up. I have no idea whether this was an intentional part of the design or not, but it works, and may go some way towards explaining why this classic design has remained almost unaltered for over a century. The Preston 2506 (upon which the design of this modern Quangsheng 2506 is based) was Preston's second design of a shoulder rebate plane, omitting the unworkably fiddly adjustment mechanism of the 1369 and adding a removable and reversible fence. Originally the fence was an option but was later included as standard on both the Preston 2506 and the later Record 2506. 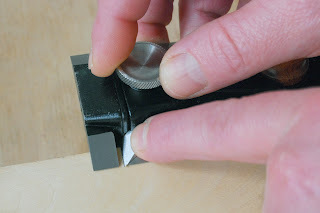 Setting the blade on a 2506 is simplicity itself, lay the sole flat on a scrap of timber, gently pressing the blade in with your fingertip, and then tighten the knob. The harder the wood you use to set it, the finer the shaving. Thanks Matthew, great post buddy, I'm sure this one has helped many.